Artists in Dialogue is a new two-person exhibition series launching at Lesley Heller Workspace. The series presents two artists’ work with the aim of offering the viewer additional insights, parallels and understanding of each artist’s practice through the relationships created by the dual installation of their work. The first edition of Artists in Dialogue presents the work of photographer Katherine Newbegin and sculptor Jim Osman. Katherine Newbegin’s photographs explore vacant and long unused places of leisure, travel and transitional occupancy. All of these spaces are deeply informed by the traces of the human activities that had once taken place there, and linger now only in the remnants left behind. The architecture of these hotel rooms, sanatoriums, and auditoriums, holds a stifling sense of deadness, as if already ossified, channeling imagery of a distant yet recent history. Newbegin’s newest series of photographs explore Polish and Lithuanian hotels and sanatoriums which were used in the 1970’s as vacation and therapeutic destinations by citizens of the former Soviet Union. 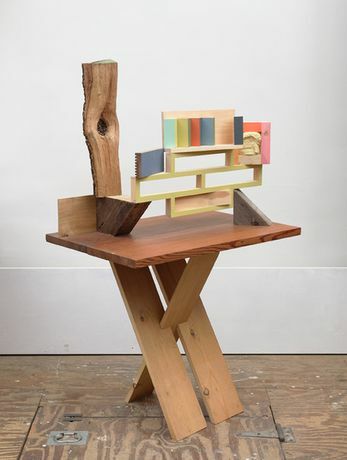 Jim Osman’s sculptures center on explorations of structure, architecture and space. Working with wood, paint, and construction paper, Osman instinctively combines materials, forms and colors to create dynamic 3-dimensional compositions. The sculptures presented in this exhibition range from complex free-standing floor pieces, to smaller and more intimate sculptures with simplified geometric contours. The sculptures excavate formal relationships of line and structure and invite contemplations on architecture, furniture and the materiality of wood.